4 oz All In One handmade soap: What if you could have one soap you could bathe, shampoo and shave with all in one? What if you were able to free up space in your shower of bottles of shampoo, shaving cream or body wash. What if you could do all that and have an all natural bar of soap that is anti bacterial, anti fungal that cleans you skin and scalp and helps heal skin challenges with it's tea tree oil and other natural carrier oils?We are happy to invite you to try All In One handmade soap a truly unique bar soap that fills a big void in skin, hair and beard management. Our soap lasts longer and stays harder when you keep it out of the spray of water when not in use. Try one of our soap savers for excellent skin exfoliation and increased life of your investment. Makes thousands of tiny bubbles to clean and exfoliate your skin. Comes in different colors. Contains:Ingredients: Olive Oil, Water, Coconut Oil, Sodium Hydroxide, Organic Palm Oil, Shea Butter, Castor Oil, Essential Oils of Tea Tree, Rosemary, Peppermint, Lavender, Chamomile Powder. 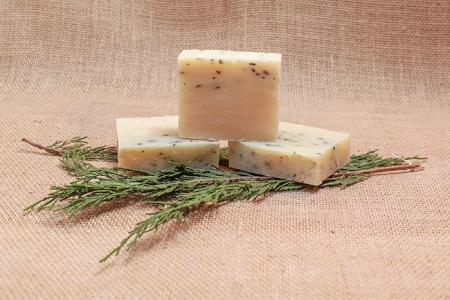 Bay Rum Bar Soap This soap fragrance is for the guy who loves the old spice kind of aroma. Back in the day pirates would rub a bay leaf concoction over themselves to remove the scent of the sea after months of well, let's say less than clean personal body care habits. Blue Dolphin Bay Rum soap is a much better alternative and has a very refreshing manly fragrance. Guaranteed you will appreciate him more with this skin rejuvenating and handsomely prepared soap. It's your choice, the smell of a ripe old sea goat or a freshly showered guy with a good body scent that sticks around. Great soap for people with strong body scent. Freshen him up with a bar of spicy BAY RUM SOAP from Blue Dolphin Soap Co. a name you can trust for chemical free fresh, clean all natural body care products. Our soap lasts longer and stays harder when you keep it out of the direct spray of water when not in use. Try one of our soap savers for excellent skin exfoliation and increased life of your investment. Makes thousands of tiny bubbles to clean and exfoliate your skin. Comes in different colors.He might also like our Fresh Spice soap for shaving and shea body cream to smooth those rough hands and feet if he's a fan of spicy fragrances. Ingredients: Olive Oil, Coconut Oil, Distilled Water and Sodium Hydroxide, Organic Palm Oil, Soy Oil, Sunflower Oil, Shea Butter, Bay Essential Oil, Orange Essential Oil, Cinnamon. 4.0 oz Brown Sugar and Fig handmade Goats Milk Soap:soap made with fresh goat milk, decadent brown sugar aroma with a highlight of natural figs. Very hard to describe but wow will you love this special blend and it is amazingly great for your skin just have a look at the ingredients. Of course no chemicals in our goats milk soap. Our soap lasts longer and stays harder when you keep it out of the direct spray of water when not in use. Try one of our soap savers for excellent skin exfoliation and increased life of your investment. Makes thousands of tiny bubbles to clean and exfoliate your skin. Comes in different colors. Ingredients: Olive Oil, Coconut Oil, Water, Sodium Hydroxide, Organic Palm Oil, Fresh Goats Milk, Organic Sunflower Oil, Shea Butter, Fragrance. Soft supple skin is not easy to come by unless you are in your early years but Celebrate soap can help you reach your skin goals because of its amazing ingredients. Celebrate soap is especially hydrating for dryer maturing skin. Our soap lasts longer and stays harder when you keep it out of the direct spray of water when not in use. Try one of our soap savers for excellent skin exfoliation and increased life of your investment. Makes thousands of tiny bubbles to clean and exfoliate your skin. Comes in different colors. CONTAINS: Olive, coconut, palm oils. Shea butter base for healthy skin.Rosemary essential oil a refreshing herbal fragrance that revives the senses and is said to help ease gout and is effective with cellulite.Lavender essential oil soothes the spirit, can relieve anger and insomnia. It is an effective anti-viral, anti-bacterial, fungicide and make for a very good deodorant.Geranium essential oil heavy aroma rose like fragrance, calms anxiety and may help clean away external body toxins. Sweet Orange essential oil is refreshing citrus aroma and is good for relaxing sore muscles. When you just have to have an island break this is one of our customer favorites especially in the winter when the snowbirds go home and they wish they were back in Florida. It's all natural and its vegan with no chemical or preservatives. Fresh coconut fragrance and other tropical ingredients enhance this beautiful relaxing soothing clean smelling soap. Tropical and refreshing, it contains everything you love except the sand. Enjoy! Our soap lasts longer and stays harder when you keep it out of the direct spray of water when not in use. Try one of our soap savers for excellent skin exfoliation and increased life of your investment. Makes thousands of tiny bubbles to clean and exfoliate your skin. Comes in different colors. (Vegan) Ingredients: Olive Oil, Water, Coconut Oil, Sodium Hydroxide, Organic Palm Oil, Soy Oil, Sunflower Oil, Shea Butter, Fragrance. May Also Contain Tocopherols (natural vitamin e) and Stearic Acid. 4.0 oz Cucumber handmade bar soap. Refreshingly spring like, splash-worthy vegan soap for your bath, sink and shower. Estheticans use cucumbers on puffy eyelids during facials for a reason so we used that trick and added the wonderful aroma of melon and low and behold come this fantastic soap. So kind to your skin and so beautifully fragrant because of the added melon aroma that it will become a fast favorite of yours. The blend of oils below offer amazing results for beautiful, soft and youthful looking skin. Fast becoming a big seller so don't hesitate putting this soap in your shopping cart. Our soap lasts longer and stays harder when you keep it out of the direct spray of water when not in use. Try one of our soap savers for excellent skin exfoliation and increased life of your investment. Makes thousands of tiny bubbles to clean and exfoliate your skin. Comes in different colors. Ingredients: Olive Oil, Water, Coconut Oil, Sodium Hydroxide, Organic Palm Oil, Organic Sunflower Oil, Shea Butter, Fragrance, Organic Aloe Concentrate, Chromium Oxide. ELLIE'S LOVELY HANDMADE SOAP is an absolute fragrant favorite of many of my customers. If you love smelling fresh and just plain pretty after your bath or shower this is a sure fire pick. It's made with the usual all natural oils in our base soap ( olive, coconut, palm and shea butter ) ground organic oatmeal for skin healing qualities and exfoliate. The soap is named after a family member who holds a very special place in my heart so I wanted this to be a very special soap. I make a lotion and a body spray to match this soap so try them all while you are placing your order safely through Pay Pal on our website. Our soap lasts longer and stays harder when you keep it out of the direct spray of water when not in use. Try one of our soap savers for excellent skin exfoliation and increased life of your investment. Makes thousands of tiny bubbles to clean and exfoliate your skin. Comes in different colors. Our new bars are 4.5 oz and they are big so you may want to cut them in half with a steak knife and use them for the shower and the sink. People who are dedicated herbal soap users will love this mostly organic soap. Great lather, minty scent and just really very cleansing. Frankincense essential oil is a very expensive EO and it has been used since the time of Jesus. Rosemary has anti-microbal and antiseptic which may qualities that can be beneficial in eczema and psoriasis management. Spearmint has antiseptic and disinfectant properties. Feel safe and very clean using this healing and moisturizing soap to cleanse your body. Our soap lasts longer and stays harder when you keep it out of the direct spray of water when not in use. Try one of our soap savers for excellent skin exfoliation and increased life of your investment. Makes thousands of tiny bubbles to clean and exfoliate your skin. Comes in different colors. Ingredients: Organic Palm Oil, Water, Organic Sunflower Oil, Organic Coconut Oil, Sodium Hydroxide, Organic Olive Oil, Essential Oils of Rosemary, Frankincense and Spearmint, Frankincense and Rosemary Powder. 4.5 oz Protect yourself or your dog from annoying insects naturally without the use of harsh commercial chemicals. Freedom Bar Shampoo discourages mosquitos, ticks, no see-ums, gnats, chiggers, fleas and bed bugs. Freedom Insect Repellent Bar Soap is improved for safe effective discouragement of insects on both you and your dog as well. FREEDOM Soap is all natural and it repels no-see-ums, fleas, ticks, chiggers, sand fleas and mosquito's and bed bugs. If you love the outdoors you accept their place in nature. I'm not a fan of spraying my body with toxic chemicals, so I use my soap as an all natural alternative for my family. The great thing is it really works and I don't have to spray my dog or myself with toxic DEET! Our soap lasts longer and stays harder when you keep it out of the direct spray of water when not in use. Try one of our soap savers for excellent skin exfoliation and increased life of your investment. Makes thousands of tiny bubbles to clean and exfoliate your skin. Comes in different colors. I shower in the morning (head to toe) before work or a sporting event and it lasts the whole day. It's perfect for hiking, camping, fishing, golfing or while on hunting trips. When you shower with Freedom Insect Repellent bar soap it deposits into the pores and when you begin sweating ( this is when bugs are really attracted ) and stays with you protecting you from insects that normally would feast on you. It works for us and we have plenty of testimonial from others who use it exclusively when heading for the outdoors.Try our Freedom Natural Spray Repellent for use throughout the day if you prefer a spray instead of soap. Contains: Olive, coconut, palm oils and shea butter base for healthy skin. Tea tree oil helps the immune system to fight off invading organisms. It is said to have strong anti-viral, anti-fungal and anti-bacterial properties. Eucalyptus is germicidal, healing and has camphor's woody undertones. Great insecticide, deters mosquitoes. Penny-royal is valuable in repelling insects on animals avoid use during pregnancy and not for use on CATS. Citronella sweet lemony scent essential oil is also a valuable insecticide and repellent. This is not an insecticide product which means it does not kill them it discourages them. The man who shaves his beard and or head loves Fresh Spice shave soap. It's one of our most selected choices by men for its fragrance and multi-uses. It has a manly fragrance and is an excellent body, facial and shaving soap all rolled up in one. Raises the beard and softens it for a smooth razor glide and clean cut.Excellent for shaving face, body and yes even your shaved head. It has a fragrant spicy scent that reminds me of watching my Dad shave when he would get ready to go out for the day. He always smelled so wonderful after the shave. Our soap lasts longer and stays harder when you keep it out of the direct spray of water when not in use. Try one of our soap savers for excellent skin exfoliation and increased life of your investment. Makes thousands of tiny bubbles to clean and exfoliate your skin. Comes in different colors. Ingredients: Olive, coconut and palm Oil, shea butter, distilled water, sodium hydroxide ( lye ). All spice, clove, cinnamon, sweet orange essential oils, ground cinnamon, clove, oatmeal and orange peel. Lots of fine ingredients and oh what a fragrance. 4 oz Fruity Mango Bar Soap. Mango and aloe combined for a ripe, sweet, complex and rich tropical mango aroma. Much like a beautiful and balmy Florida evening this tropical soap will bring out some fun in you and enliven your spirits. Excellent oil combination helps control dryness, irritation and scaly skin conditions. I love this product and I believe you will to. Join the Mango mania and nourish your skin today place a few bars in your shopping cart and feel the tropics come alive. Our soap lasts longer and stays harder when you keep it out of the direct spray of water when not in use. Try one of our soap savers for excellent skin exfoliation and increased life of your investment. Makes thousands of tiny bubbles to clean and exfoliate your skin. Comes in different colors. Ingredients: Olive Oil, Water, Coconut Oil, Sodium Hydroxide, Organic Palm Oil, Organic Sunflower Oil, Shea Butter, Fragrance, Organic Aloe Concentrate, Annatto Powder. 4 oz Ginger Lime Bar Soap. What you put on your skin is important and what better than healing ginger and fresh island lime a unique blend of essential oils. This is a very skin friendly bar soap. Both men and women both enjoy this fragrance. You will feel good about stocking up and enjoy this beautifully blended chemical free bar soap. Nourish your skin to thrive with this excellent soap selection. 4 oz Grapefruit Margarita Bar Soap is a tropical blend of fresh ingredients that will invigorate your and enliven your skin and spirits. Great morning soap to shower with and for skin challenges. Grapefruit, Orange and Lime for a blended balanced citrus aroma. Each time you smell this soap it seems to change scents. Smells like grapefruit sometimes and more like orange or lime other times, but always smells like fresh citrus. This natural soap also contains aloe and shea butter for soft silky skin, and produces a rich lather that will be sure to satisfy your skin. Nourish your skin with each and every soap encounter. 4 oz Honey Oatmeal bar soap is one of the most highly beneficial handmade skin soaps that you can purchase. There are many brands to choose from but not all are equally comparable because there are so many different formulas used to make these soaps. Our particular recipe uses fresh, local raw unprocessed honey which is especially skin healing. Skin challenges respond quickly to this soap because it's combined in a shea butter, coconut, olive and palm oil base. These excellent ingredients are very compatible with each other and work with a very wide range of skin types. All of our soaps are skin nourishing but this soap is exceptionally healing and soothing to the skin. Once you use this handcrafted soap you will understand with in minutes why so many with skin sensitivities and other challnges have turned to this product. Honey is an amazing product that has cured open wounds when medicines failed. Learn more about this pure natural product and you will be truly amazed as were we. The cost is more than our typical soap because of the additional ingredients and special handling of the product. Most feel it is insignificant when they use and enjoy the product on a daily basis. K-9 Shampoo Bar stops insects and hotspot biting. K-9 is a natural repellent product made for those who are concerned about using chemicals, detergents and preservatives on their dogs coat and skin. Let's face it dogs love getting into things especially stuff we really don't want them in ( you know what I'm talking about ). When you bath them with K~9 bar shampoo you are not only cleansing their coats and skin but you are also taking care of any residing fleas, mites, ticks and that awful wet smelly dog scent they may be carrying around with them. K-9 can help get rid of relentless hot spot biting because it cleans and rids them of pests that cause it and it helps heal existing hotspots and stings. One bar lasts multiple uses especially if you cut it in half and use half the bar and shelve the other half till you need it again. K~9 is Powerful natural protection. Ingredients: Saponified olive, coconut, palm oils with distilled water and sodium hydroxide-lye. We add shea butter to super fat the product. Essential oil blend of citronella, tea tree and eucalyptus, pennyroyal, (should avoid if pregnant ), grapefruit seed extract. 4.0 oz This great lavender soap makes for a rich lavender experience. Lavender essential oil is known to be analgesic, antidepressant, antiseptic, and antiviral as well as a bactericide, decongestant, deodorant, and fungicide. Lavender is also known to soothe minor burns and sunburn. Did you know that many radiation patients have been known to use lavender soaps lotions and oils on their radiation burned skin with much success. Please look at the list of ingredients which will help you decide if this soap can benefit you and your skin challenges. Ingredients: Olive Oil, Water, Coconut Oil, Sodium Hydroxide, Organic Palm Oil, Organic Sunflower Oil, Shea Butter, Lavender Essential Oil, Ultramarine Pigment. All natural Lemongrass Bar Soap is made with lemongrass essential oil and real lemongrass to accent this lemon-rich soap. Enjoyed by many for its unique citrus smell, this essential oil is also known to relieve fatigue and aid in the flow of milk in nursing mothers as well as other stress and anxiety remedies. A stand out soap for it's fragrance and cleaning ability. Awesome fragrance crisp and clean. Contains: Lemongrass essential oil, aloe concentrate, parsley powder, natural vitamin e., cucumber concentrate, coconut, organic palm and shea butter (olive, rice bran, saponified vegetable oils). LILAC is what reminds me of spring time.I remember my neighbors gated garden, she had large beautiful tulips and mixed roses and other amazing springtime flowers. There was one other bush that shot to the top of my fragrance list and that was LILAC. A scent of it's own and none other like it. We get several requests for this soap often enough that I made it for both me and my customers. If you like the smell of Lilac try this soap and have your own fond memories. I'll bet that you will enjoy your soap down to the very last little particle. So, what are you waiting for. Go to our ESTORE and start shopping while this soap is still in stock. Better order more than one. This is so nice. Lilac Ingredients: Olive Oil, Water, Coconut Oil, Sodium Hydroxide, Organic Palm Oil, Soy Oil, Sunflower Oil, Shea Butter, Fragrance, Ultramarine Pigment. May Also Contain Tocopherols (natural vitamin e) and Stearic Acid (vegetable source). 4.0 oz Organic Bergamot Handmade Soap a special blend of tropical bergamot, lemon, orange with a touch of cassia makes for a unique citrus blend that is unique and loved by both sexes. Refreshingly clean and uplifting are the words out our customers mouths when describing their take on this fantastic soap. You'll love the feel and the islandy aroma. Check out the oil blend in this soap you know it's gotta be great. Ingredients: Organic Palm Oil, Water, Organic Sunflower Oil, Organic Coconut Oil, Sodium Hydroxide, Organic Olive Oil, Essential Oils of Lemon, Orange, Bergamot, and Cassia, Iron Oxide. 4 oz Orange Blossom Soap This healthy soap livens the spirit and is a great skin cleanser for moderate to oily skin. Make your morning shower special with this delightful all natural vegan soap. Rich lather and high end orange essential oil, promise! Check out the ingredients, it's all very natural. Many of our snowbird friends order this product all year long even when it's 20 degrees outside. Hey why not? Ingredients: Organic Palm Oil, Water, Organic Sunflower Oil, Organic Coconut Oil, Sodium Hydroxide, Organic Olive Oil, Orange Essential Oil. 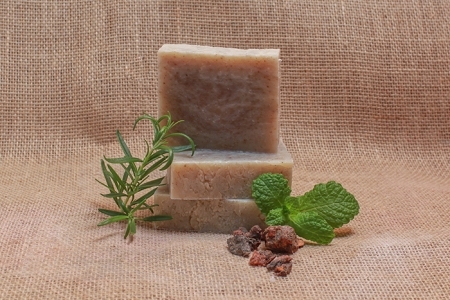 4.0 oz Patchouli Soap with essential oil of earthy, woodsy lingering aroma. Lovers of patchouli will appreciate how it stays with them, even penetrating into clothing. Patchouli is an excellent skin rejuvenating oil so people with tough skin challenges seem to love its skin healing properties. Others with strong body odor also appreciate its fragrance for all day protection. Whatever your reasoning our patchouli is excellent and 100% all natural. Peace, love and happiness is the credo of patchouli soap admirers. 4.5 oz Our absolute number one selling soap is now larger in size and may be cut it in half for a bar at the sink and in the shower to save you money. Made with our special base formula of shea butter, olive, coconut and palm oil as well as our proprietary mx of lavender, peppermint and tea tree essential oils with lavender petals. Just read the testimonials on this product. I have had so many people with skin disorders tell me that this soap has quickly cleared many of their problematic skin issues. RESTORZ skin clearing ingredients have properties that help manage some very difficult acne breakouts, psoriasis, eczema and diabetic skin challenges. Skin disorders are complex, but if your problem has to do with bacterial accumulation and pore clogging this soap may be a natural antibacterial solution. You will absolutely love the big bar size of this soap and the big lather you get with just a few turns in the hand. Round off your purchase with a tin of Amazing Healing Salve to help promote natural skin healing and moisturization with chamomile and tea tree oils. If you have acne scared skin try our certified organic Tamanu oil. You will be amazed at the improvement as have so many of our customers before you. We also make a tamanu and tea tree oil product if you require more than just scaring relief. Here's an unsolicited testimonial from a local young lady that sums up the effectiveness of our natural product. Good Morning, My name is Brooke and I have been using Restorz for a few years now. I met you at a craft fair in Cocoa Village, and Restorz cleared up an allergic rash I had on my face. I returned to your booth the next day to show you the results. Since then, I have been able to eat foods that used to make me break out with acne, wear my favorite cosmetics without getting acne, and never doubted for a moment that my skin would be perfect on my wedding day. I refer everyone I know who has any sort of skin ailment to your website. They have all come back raving! I would say, about 15-20 people. And they are telling their friends, too!! I recently went on a cruise and met a girl who had the most severe acne I have ever seen. Her breakouts looked more like herpes blisters than acne pimples. I broke off a piece of my own bar and gave it to her. The next morning you could already see a difference, and by the next day all she had left were some raw spots that needed to heal. But no breakouts. I think you guys would benefit tremendously from more publicity and hope to see you advertising more in the future!! I will continue to spread the word! We have so many stories similar to this, but we'll let you tell us about your experience and honestly your compliements are every bit as good as being paid. Well almost! Thanks again. Sandalwood Soap is highly moisturizing and can be effective in reducing fine lines and wrinkles.Shea butter is used to super fat and also to hydrate and repair the skin. When women come to our booth they always pick this bar of soap for their husband. They smell it and say "that's a very nice aroma". I usually say to them, well why don't you buy it then you can smell it all the time. Although men mostly request this soap, women find its fragrance alluring. This is a perfect special gift soap for the man in your life with a very pleasant smelling aroma. It's just a very nice lingering scent that is said to increase libido and has an aphrodisiac effect on some people. That can't be all that bad now can it? Surprise your mate give them something they will enjoy over and over again. Lingering, sensuous, exotic aroma that persists even after washing. Contains: Olive, coconut, palm oils for healthy skin, shea butter excellent anti-aging product, reduces wrinkling and delivers fast results for many. Sandalwood fragrance oil is said to be an aphrodisiac and euphoric. Ground Organic Oatmeal acts as an effective mild exfoliate. Such a beautiful a fragrance it reminds me of my Wedding Day. Delightful plumeria and alluring ylang ylang essential oils are perfectly combined to surround your senses in island flower scent in a larger bar for longer lasting use. Innocent yet sensuous and very soothing and hydrating to your skin. Women love the fragrance and men can't resist it's alluring scent. Lingers pleasantly after use. INNOCENTLY ATTRACTS Partners love the lingering fragrance of this very popular soap. When I use it my husband always tells me how good I smell. After 40 years of marriage, I still love all the compliments. You will to. Attract your special someone tonight. Beautiful mild fragrance is what many say about the Plumeria. I blend this fragrance with Ylang-Ylang essential oil and calendula flower petals. Please make suire you put this one in your shopping cart for a beautiful smelling and ultra lathering bar soap. 4 Crook's is a recipe handed down from the15th century during a period of dire bubonic plague in Europe. It was said to be caused by transmission of flea bites from infected rats.The story goes that there were 4 crook's who developed a blend of herbal essential oils diluted in vinegar which they doused their bodies in before making contact with the dead and dying. It was said that the concoction somehow kept them from getting the sickness while stealing all the gold, money and jewelry from the afflicted. Once caught by authorities, the King offered leniency if they shared their secret. Who knows if this “thieves” story is accurate, but the essential oils are said to be antiseptic, antiviral, antibacterial, and anti-infectious. They will stimulate the immune system, circulation, and respiratory system, and help protect against the flu, colds, bronchitis, pneumonia, sore throats, cuts, and more. The Weber State University did a study that found Thieves essential oil blend to have a greater than 99% success rate at killing airborne bacteria. We don’t know whether or not the “thieves” story is true, but the essential oils are antiseptic, antiviral, antibacterial, and anti-infectious. They will stimulate the immune system, circulation, and respiratory system, and help protect against the flu, colds, bronchitis, pneumonia, sore throats, cuts, and much more. The soap is magnificent and very skin moisturizing. Whenever there are sick people in my home out comes 4 CROOK'S and soap. Personally, I like it anytime in between because I am a clove and cinnamon fan. Did you know that Clove is an amazing germicide which is why it's use it to control tooth bacteria. It is also used as a natural fly repellent for horses. Contains Olive, coconut, palm oil, distilled water lye and shea butter. Clove, cinnamon, lemon, rosemary and eucalyptus essential oils. Our products are for external use only and may irritate the skin, eyes and mucus membranes of those sensitive to the ingredients. BLUE DOLPHIN SOAP CO. LLC accepts NO responsibility for improper use and storage of any / all of their products. Discontinue use if any irritation or allergy occurs. Statements made or products sold through this website have not been evaluated by the Food and Drug Administration. These products are not intended to diagnose, treat, cure or prevent any diseases. Consult a qualified health care practitioner before use of our products especially if pregnant or taking other prescribed medications. All product sales are final, we do not accept returned items for possible contamination and shipping reasons.